Litho printed onto a high quality 400gsm Silk card, our Presentation Folders are perfect for keeping important documents together in a professional and organised way. 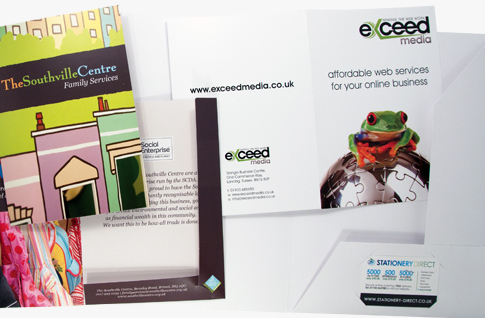 We offer A5 and A4 folders in a choice of styles and finishes. We can print single or double sided in full colour with an optional Matt Laminate finish. We offer a choice of templates to choose from to suit your needs, some have slots to fit an 85mm x 55mm Business Card. A Matt Laminate finish will give your folders a protective coating, like a transparent film of plastic. This will give them a luxury feel, make them more sturdy and help protect from marks and general wear and tear. If your artwork has a large area of solid colour, especially a dark colour spanning the spine and folds we would recommend that you order our laminated folders. Presentation Folders offer a perfect solution to keeping important papers and documents tidy ready to give out to prospective and existing clients. They look great when personalised to match your existing stationery and they really add a professional touch to the contents inside. Make a great impression at your next meeting and stand out from the rest!